The body is Danville yellow thread and varnish – 3 coats and wait a week. It is simple but requires patience. 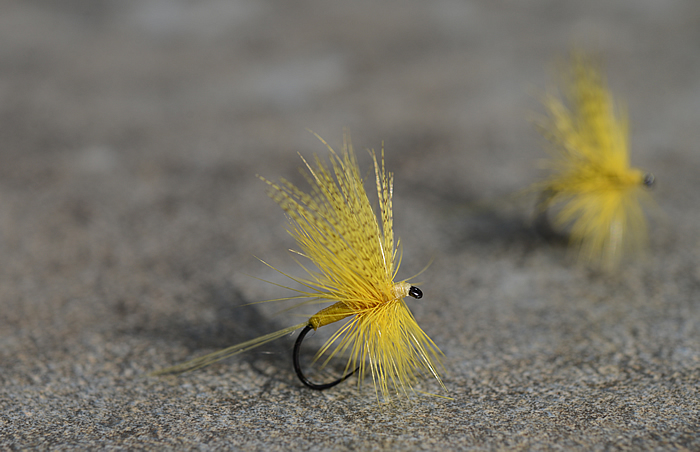 The hackle and dyed mallard is dyed by me to suit my expectation – a brighter yellow than any production fly. I do not dye a complete cape, but select the feathers I want from a white cape, and dye accordingly. I note that I changed thread at the head to Veevus to minimize bulk, but it does have the same saturation as Danville. I do not like applying “cement” to the head once done to reduce bleeding back to the had, so I just tie a nice whip finish knot with wax.